Salmon with Basil Cream Sauce | Om nom nom! 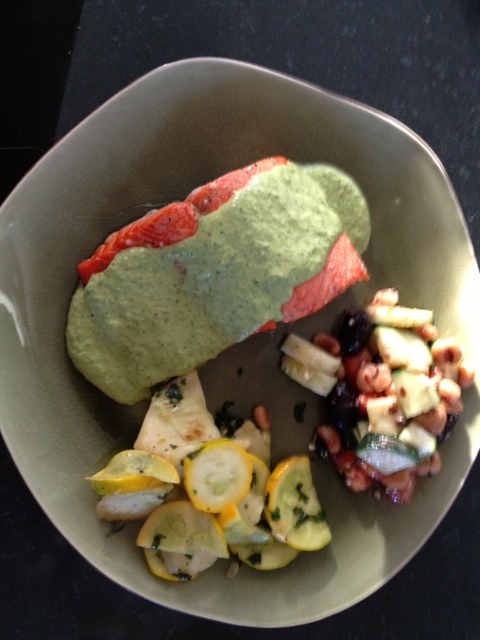 Salmon Filets – I baked them, but you could really prepare them however you like. In a food processor, combine basil and garlic. Begin processing, and pour in olive oil in a thin stream. Process for about 40 seconds, or until mixture begins to emulsify. Add pine nuts and Parmesan, then blend for 1 minute. Heat cream in a saucepan over low heat until simmering. Pour 1/2 of the hot cream into the processor with basil pesto, and pulse for 20 seconds to incorporate. Pour mixture back into cream, and simmer for 5 minutes, or until thickened.